Meet, enjoy, breathe, sense, smell Latvia! Tranquillity and power of nature will provide unforgettable recreation either for a family or anyone else who is desperate for silence and peace. 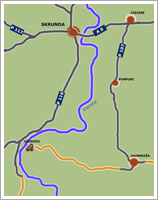 Gāznieki house is located only 150km from Riga to Liepāja direction, between town of Skrunda (~8km) and village Jaunmuiža (~5km) on the right bank of river Venta. Gāznieki consists of several buildings. The main Guest house has three bedrooms with 9 beds (additional 5 are available if necessary). Kitchen (fridge, dishwasher, electric kettle and stove, microwave), shower/toilet and the living room with fireplace and satellite TV are available on the ground floor. If necessary 10 more people can sleep in the owner’s house. For those guests who want to spend days and nights fishing a separate small Fishermen’s cabin is available with two beds. The catch could be smoked in the special smoke chamber. A special Party house for up to 35 people is available for those guests who are looking for celebration of any personally important event in the country environment. An open air dancing stage as well as football, beachball, volleyball, streetball, softball fields are available. It is hard to imagine a country house without sauna. In Gāznieki the firewood heated sauna is located near the pond where one can cool off after steaming and flapping with birch, oak or other fresh or dried branches and rubbing with honey and salt. A romantic night for a couple is possible in the loft of Sauna house. 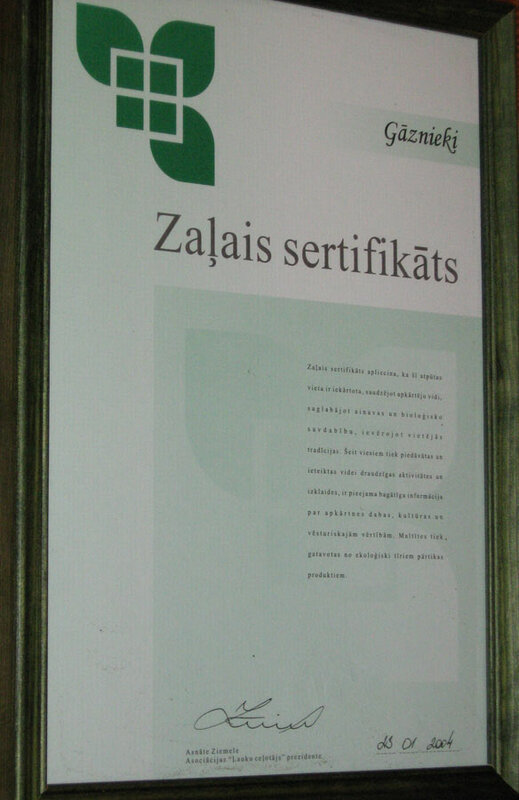 Gāznieki has been awarded with the Latvia’s Green Certificate. Total area of Gāznieki land is 2 hectares, the ecological requirements have been taken into consideration in the construction of the house. The forests nearby are rich in mushrooms (including Boletus, Chantereles). The river Venta is good for fishing. Forest trails are suitable for cycling. A rare bird – black stork nests in the forests surrounding Gāznieki. Gāznieki has a long history. In the 17th century during the reign of the Duke Jacob of Courland a sand quarry was established near Gāznieki and a glass kiln started to produce not only for local needs but also for export to the colonies of the Duchy in Tobago and Gambia. The original name of the house is “Glāznieki” (“glāze” in Latvian means “glass”), however the letter “l” disappeared. On the other bank of Venta, opposite to Gāznieki, a catholic church of Lēnas (built 1740-1750) is located. Catholic churches in the Western Latvia are rare. The church is a state protected architectural monument. Venta is excellent for canoeing, the stretch between Nigrande and Gāznieki/Skrunda is the most picturesque and relatively the “fastest” part of Venta. In 1991 a Devon period fossils of the so called “Ventasstega” (lived approx. 350 millions years ago, a tetrapod partly resembling both fish and alligator) were found between Gāznieki and Nīgrande. 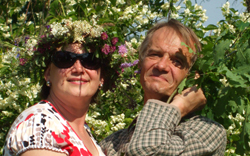 The owners of place since 1992 and your hosts are Ineta Kalnina and Helmuts Kalnins.